Too many creative professionals focus too much on their artistic abilities and too little on their business interests. 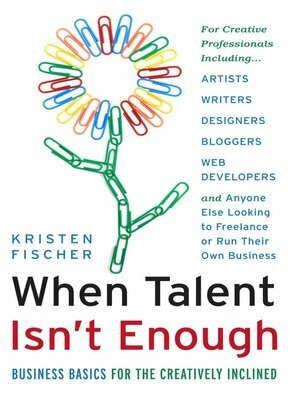 In When Talent Isn't Enough, self-employed copywriter and journalist Kristen Fischer offers powerful strategies and practical stories from some of today's most prominent creative leaders to help you thrive while self-employed. The result: an easy-to-read guide that covers all aspects of launching and managing a successful business for any creative entrepreneur or solo practitioner. When Talent Isn't Enough provides the foundation that any writer, designer, illustrator, or Web developer needs to create lasting success as an entrepreneur.